SPECIAL WEAPONS & AMMUNITION T he recent firing of Chicago's police superintendent Garry McCarthy following protests and anger over the shooting of a teenager by a Chicago police officer has caused many law enforcement agen- cies to look for ways to avoid the use of deadly force. Chicago Mayor Rahm Emanuel believed that the shooting had caused many residents to lose trust in the police. This is just one example. In fact, there have been recent protests and tremendous social unrest in places like Ferguson, Missouri; Minneapolis, Minnesota; and other large U.S. cities over the police involved deaths of civil- ians. Many of these situations have a firearm at their core. 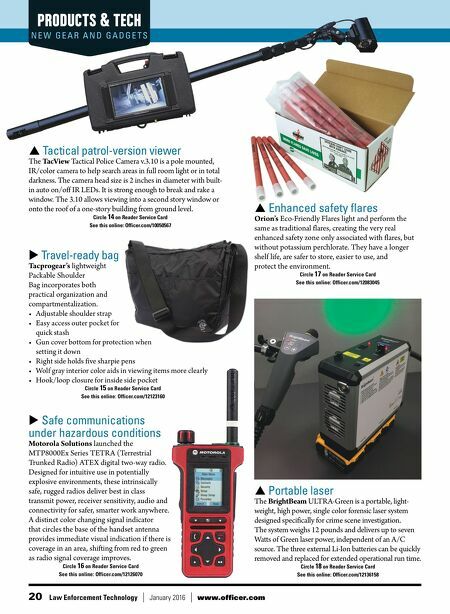 In light of this, a growing number of law enforcement agencies and departments are looking for ways to eliminate fatal encounters www.officer.com January 2016 Law Enforcement Technology 21 Don't forget about the bean bag By David Volz less lethal options Understanding your More agencies are exploring the potential of less lethal projectiles. 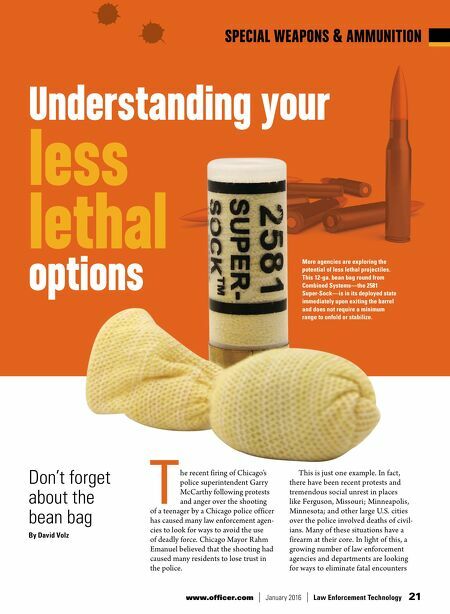 This 12-ga. bean bag round from Combined Systems—the 2581 Super-Sock—is in its deployed state immediately upon exiting the barrel and does not require a minimum range to unfold or stabilize.